How to practice henna to get results! Get ideas to up your henna game and expand your henna vocabulary. Everyone needs practice, even professionals. Professional athletes don’t just play on game days. They practice every day: so do musicians and singers. Practice is what gets you into the big leagues, but you need to continue to practice to stay there. Ok, so you already know that you need to practice, but exactly HOW do you practice henna to get results? What do you practice on? You don't always need skin to practice. In fact, practicing isn't always pretty! You can do some of your practice on plastic sheet protectors so you can wipe away the henna and keep on practicing and do some of your practice directly on paper so you have a record of your improvement. What do you practice with? It’s best to practice with actual henna, but you don’t always need to use henna for practice. You can use marker or pens in addition to henna. I’d suggest that at least half of your practice be done with actual henna paste. If you are working on plastic sheet protectors use a dry erase marker. If you are working on paper, use a felt tip pen, sharpie, or any other writing device. Using a marker will help you build muscle memory and give you the feel of design placement, but you won’t be able to practice the pressure and flow of the actual henna paste. At least some of your practice should be with actual henna. The pressure, flow, and texture can’t be duplicated with anything else. I use the old leftover henna for practice. Never throw away henna! If you make it wrong, ruin it by letting it sit in a hot car, or whatever, you can always use it for practice. * Money Saving Tip! If you are mixing special henna for practice, mix the henna without essential oils. Let’s do the math on this. One hundred grams of henna will yield about 25 regular size cones and costs less than $10. You can do a TON of henna practice with 100 grams of henna! If you are eventually doing henna on others, nearly every henna design you do will be $10 or more so your first design pays for the practice henna. Create muscle memory by tracing a design. Once you’ve traced a design, free hand that same design over and over until you get it just right. In the middle of free handing a design, go back and trace the original again to be sure you are getting it correct. Do an entire page if you need to, but do it until you feel comfortable. Practice should be done on a regular basis. It doesn’t have to be every day, but once a month isn’t going to yield many benefits. Find a practice schedule that works for you. Consider adding a rest day in-between practice sessions. This gives your brain some time to let the practice sink in. Instead of trying to practice everything at once, practice a few things a day. Doing 2 designs 25 times each is better than doing 25 designs 2 times each. This is the most important part of practicing henna! The basic henna elements should be the bulk of your practice. Practicing the basics allows you to focus on the overall design of your work. The basics should be able to be done in your sleep. First, trace the element. Do this a couple of times if you need it. When you are ready, start free-handing the element over and over. Do rows and rows and rows of a single element. Do at least 7-10 rows of the same element during your practice sessions until you feel you have that element cemented in your henna vocabulary. Once you have a specific element down, drop your practice to 2-4 rows of that element and move on to another henna basic element. If you are not familiar with the basic henna elements check out the Basics & Beyond eBook. Practice draping long straight henna lines until it become natural. Keep in mind, on paper, you will be draping lines as long as you can, up to 8 inches. On a hand or foot, the most you’ll need to drape a line is 2.5-3 inches, generally. Practicing with these long lines forces you to learn control. Do half a page of full rows of draped henna lines. For the other half of the page, do smaller 2-3 inch lines. Focus on pressure and speed in different combinations. Drape lines right next to each other to create thicker lines. Practice drawing (rather than draping) straight lines too. You can’t drape a line on a vertical surface such as an upper arm or back piece, so you’ll need to be able to create straight lines by actual drawing lines in henna. Pick 2 or 3 basic elements and practice combining them. Do an entire page of these designs with each row being a different combination of the same few basic elements. 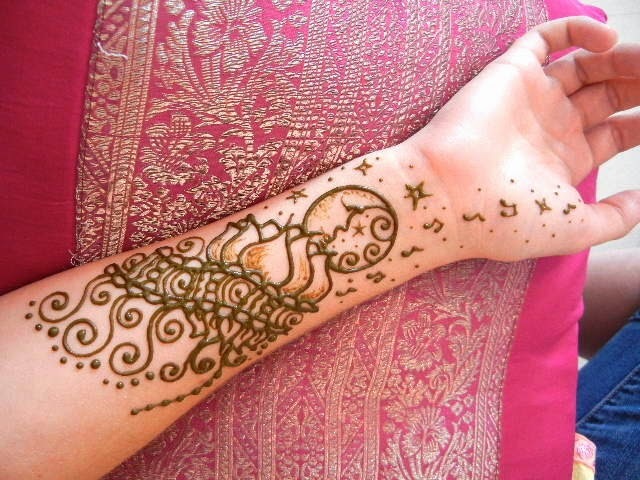 There are a number of very common designs that are used in henna in different combinations. Practice these common motifs over and over until they are deeply embedded in your henna vocabulary. These don’t have to be common to henna, but they should be common to you and the henna style you prefer. As you improve, practice full blown henna designs. My favorite way to do this is to use our hand template and do mirror images. This forces you to work against your natural left/right bias and helps you develop and eye for symmetry. The idea is to incorporate henna practice into your routine so that you can grow and improve as a henna artist. Labels: henna design, henna practice, how to henna. New Henna Artists Guild of Orlando Meeting!